For other uses, see New Year's Day (disambiguation). For the day itself, unrelated to celebration of the New Year, see January 1. New Year's Day, also simply called New Year[disputed – discuss] or New Year's[disputed – discuss], is observed on January 1, the first day of the year on the modern Gregorian calendar as well as the Julian calendar. Mesopotamia (Iraq) instituted the concept of celebrating the new year in 2000 BC and celebrated new year around the time of the vernal equinox, in mid-March. The early Roman calendar designated March 1 as the first day of the year. The calendar had just ten months, beginning with March. That the new year once began with the month of March is still reflected in some of the names of the months. September through December, our ninth through twelfth months, were originally positioned as the seventh through tenth months. (Septem is Latin for "seven"; octo, "eight"; novem, "nine"; and decem, "ten".) Roman legend usually credited their second king Numa with the establishment of the months of Ianuarius and Februarius. These were first placed at the end of the year, but at some point came to be considered the first two months instead. The January Kalends (Latin: Kalendae Ianuariae) came to be celebrated as the new year at some point after it became the day for the inaugurating new consuls in 153 BC. Romans had long dated their years by these consulships, rather than sequentially, and making the kalends of January start the new year aligned this dating. Still, private and religious celebrations around the March new year continued for some time and there is no consensus on the question of the timing for January 1's new status. Once it became the new year, however, it became a time for family gatherings and celebrations. A series of disasters, notably including the failed rebellion of M. Aemilius Lepidus in 78 BC, established a superstition against allowing Rome's market days to fall on the kalends of January and the pontiffs employed intercalation to avoid its occurrence. In 567 AD, the Council of Tours formally abolished January 1 as the beginning of the year. At various times and in various places throughout medieval Christian Europe, the new year was celebrated on December 25 in honor of the birth of Jesus; March 1 in the old Roman style; March 25 in honor of Lady Day and the Feast of the Annunciation; and on the movable feast of Easter. These days were also astronomically and astrologically significant since, at the time of the Julian reform, March 25 had been understood as the spring equinox and December 25 as the winter solstice. (The Julian calendar's small disagreement with the solar year, however, shifted these days earlier before the Council of Nicaea which formed the basis of the calculations used during the Gregorian reform of the calendar.) Medieval calendars nonetheless often continued to display the months running from January to December, despite their readers reckoning the transition from one year to the next on a different day. Among the 7th century pagans of Flanders and the Netherlands, it was the custom to exchange gifts on the first day of the new year. This custom was deplored by Saint Eligius (died 659 or 660), who warned the Flemish and Dutch: "(Do not) make vetulas, [little figures of the Old Woman], little deer or iotticos or set tables [for the house-elf, compare Puck] at night or exchange New Year gifts or supply superfluous drinks [another Yule custom]." However, on the date that European Christians celebrated the New Year, they exchanged Christmas presents because New Year's Day fell within the twelve days of the Christmas season in the Western Christian liturgical calendar; the custom of exchanging Christmas gifts in a Christian context is traced back to the Biblical Magi who gave gifts to the Child Jesus. Because of the leap year error in the Julian calendar, the date of Easter had drifted backward since the First Council of Nicaea decided the computation of the date of Easter in 325. By the sixteenth century, the drift from the observed equinox had become unacceptable. In 1582, Pope Gregory XIII declared the Gregorian calendar widely used today, correcting the error by a deletion of 10 days. The Gregorian calendar reform also (in effect) restored January 1 as New Year's Day. Although most Catholic countries adopted the Gregorian calendar almost immediately, it was only gradually adopted among Protestant countries. The British, for example, did not adopt the reformed calendar until 1752. Until then, the British Empire – and its American colonies – still celebrated the new year on March 25. Most nations of Western Europe officially adopted January 1 as New Year's Day somewhat before they adopted the Gregorian Calendar. In Tudor England, New Year's Day, along with Christmas Day and Twelfth Night, was celebrated as one of three main festivities among the twelve days of Christmastide. There, until the adoption of the Gregorian Calendar in 1752, the first day of the new year was the Western Christian Feast of the Annunciation, on March 25, also called "Lady Day". Dates predicated on the year beginning on March 25 became known as Annunciation Style dates, while dates of the Gregorian Calendar commencing on January 1 were distinguished as Circumcision Style dates, because this was the date of the Feast of the Circumcision, the observed memorial of the eighth day of Jesus Christ's life after his birth, counted from the latter's observation on Christmas, December 25. Pope Gregory acknowledged January 1 as the beginning of the new year according to his reform of the Catholic Liturgical Calendar. Nayrouz and Enkutatash are the New Year's Days of the Coptic Egyptians and the Ethiopians, respectively. Between 1900 and 2100, both occur on September 11 in most years and on September 12 in the years before Gregorian leap years. They preserve the legacy of the ancient Egyptian new year Wepet Renpet, which originally marked the onset of the Nile flood but which wandered through the seasons until the introduction of leap years to the traditional calendar by Augustus in 30-20 BC. In Ethiopia, the new year is held to mark the end of the summer rainy season. The Sotho people of Lesotho and South Africa celebrate Selemo sa Basotho on August 1 during the end of the Southern Hemisphere's winter. This is based on the Sotho calendar, and includes observances such as "Mokete wa lewa", a celebration which follows the harvest. Chinese New Year is celebrated in some countries around the East Asia, including China. It is the first day of the lunar calendar and is corrected for the solar every three years. The holiday normally falls between January 20 and February 20. The holiday is celebrated with food, families, lucky money (usually in a red envelope), and many other red things for good luck. Lion and dragon dances, drums, fireworks, firecrackers, and other types of entertainment fill the streets on this day. Vietnamese New Year (Tết Nguyên Đán or Tết), more commonly known by its shortened name Tết or "Vietnamese Lunar New Year", is the most important and popular holiday and festival in Vietnam, the holiday normally falls between January 20 and February 20. It is the Vietnamese New Year marking the arrival of spring based on the Chinese calendar, a lunisolar calendar. The name Tết Nguyên Đán is Sino-Vietnamese for Feast of the First Morning, derived from the Hán nôm characters 節 元 旦.
Korean New Year is celebrated on the first day of the solar calendar and lunar calendar respectively in South Korea. The first day of the lunar calendar, called Seollal (설날), is a big national holiday with the Korean thanksgiving Day, called Chuseok(추석). South Koreans also celebrate solar New Year's Day on January 1 each year, following the Gregorian Calendar. New Year's Day is also a national holiday, so people have the day off while they have a minimum of three days off on Lunar New Year. These days, many Koreans consider solar New Year’s Day as the first day of the year, while considering the first day of the lunar calendar as a traditional holiday. Koreans celebrate New Year's Day by preparing food for their ancestors' spirits, visiting ancestors' graves, and playing Korean games such as Yunnori (윷놀이) with families. Young children give respect to their parents, grandparents, relatives, and other elders by bowing down in a traditional way and are given good wishes and some money by the elders. Families enjoy the New Year also by counting down until midnight on New Year's Eve on December 31. North Koreans celebrate New Year's holiday on the first day of the solar calendar, January 1. Solar New Year’s Day, called “Seollal(설날)”, is a big holiday in North Korea, while they take a day off on the first day of the lunar calendar. The first day of the lunar calendar is just regarded as a relaxing day. North Koreans consider the first day of the solar calendar even more important. Cambodian New Year (Chaul Chnam Thmey) is celebrated on April 13 or April 14. There are three days for the Khmer New Year: the first day is called "Moha Songkran", the second is called "Virak Wanabat" and the final day is called "Virak Loeurng Sak". During these periods, Cambodians often go to pagoda or play traditional games. Phnom Penh is usually quiet during Khmer New Year as most of the Cambodians prefer spending it at their respective hometowns. Thai New Year is celebrated on April 13 or April 14 and is called Songkran in the local language. People usually come out to splash water on one another. The throwing of water originated as a blessing. By capturing the water after it had been poured over the Buddhas for cleansing, this "blessed" water is gently poured on the shoulder of elders and family for good fortune. Diwali related New Year's celebrations include Marwari New Year and Gujrati New Year. Indian New Year's days has several variations depending on the region and is based on the Hindu calendar. Malayalam New Year (Puthuvarsham) is celebrated either on the first day of the month of Medam in mid-April which is known as Vishu or the first day of the month of Chingam, in the Malayalam Calendar in mid-August according to another reckoning. Unlike most other calendar systems in India, the New Year's Day on the Malayalam Calendar is not based on any astronomical event. It is just the first day of the first of the twelve months on the Malayalam Calendar. The Malayalam Calendar (called Kollavarsham) originated in 825 AD, based on general agreement among scholars, with the re-opening of the city of Kollam (on Malabar Coast), which had been destroyed by a natural disaster. Nepal Sambat is the Nepalese New Year celebration. Pahela Baishakh (Bengali: পহেলা বৈশাখ) or Bangla Nabobarsho (Bengali: বাংলা নববর্ষ, Bangla Nôbobôrsho) is the first day of the Bengali Calendar. It is celebrated on April 14 as a national holiday in Bangladesh, and on April 14 or 15 in the Indian states of West Bengal, Tripura and part of Assam by people of Bengali heritage, irrespective of their religious faith. The Sikh New Year is celebrated as per the Nanakshahi calendar. The epoch of this calendar is the birth of the first Sikh Guru, Guru Nanak in 1469. New Year's Day falls annually on what is March 14 in the Gregorian Western calendar. Sinhalese New Year is celebrated in Sri Lankan culture predominantly by the Sri Lankan Sinhalese, while the Tamil New Year on the same day is celebrated by Sri Lankan Tamils. The Sinhalese New Year (aluth avurudda), marks the end of harvest season, by the month of Bak (April) between April 13 and April 14. There is an astrologically generated time gap between the passing year and the New Year, which is based on the passing of the sun from the Meena Rashiya (House of Pisces) to the Mesha Rashiya (House of Aries) in the celestial sphere. The astrological time difference between the New Year and the passing year (nonagathe) is celebrated with several Buddhist rituals and customs that are to be concentrated on, which are exclusive of all types of 'work'. After Buddhist rituals and traditions are attended to, Sinhala and Tamil New Year-based social gatherings and festive parties with the aid of firecrackers, and fireworks would be organized. The exchange of gifts, cleanliness, the lighting of the oil lamp, making kiribath (Milk rice), and even the Asian Koel are significant aspects of the Sinhalese New Year. Telugu New Year (Ugadi), Kannada New Year (Yugadi) is celebrated in March (generally), April (occasionally). Traditionally, it is celebrated as Chaitram Chaitra Shuddha Padyami in parts of Andhra Pradesh, Telangana and Karnataka to mark the event of New Year's Day for the people of the Deccan region of India. It falls on a different day every year because the Hindu calendar is a lunisolar calendar. The Saka calendar begins with the month of Chaitra (March–April) and Ugadi/Yugadi marks the first day of the new year. Chaitra is the first month in Panchanga which is the Indian calendar. Panchangam (almanac), is read in temples to mark the start of the Year. The Old New Year in Serbia is commonly called the Serbian New Year (Српска Нова година / Srpska Nova godina), celebrated on January 14 as the start of the New Year by the Julian calendar. The Serbian Orthodox Church, with traditional adherence in Serbia (including Kosovo), Bosnia and Herzegovina, Montenegro and Croatia, celebrates its feasts and holidays according to the Julian calendar. A part of the population celebrates Serbian New Year in a similar way as the New Year on January 1. This time, usually one concert is organized in front of either City Hall or the National Parliament (in Belgrade), while fireworks are prepared by the Serbian Orthodox Church and fired from the Church of Saint Sava, where people also gather. Other cities also organize such celebrations. Restaurants, clubs, cafes and hotels are usually fully booked and organize New Year's celebrations with food and live music. Hijri New Year in the Islamic culture is also known as Islamic new year (Arabic: رأس السنة الهجرية Ras as-Sanah al-Hijriyah) is the day that marks the beginning of a new Islamic calendar year. New Year moves from year to year because the Islamic calendar is a lunar calendar. The first day of the year is observed on the first day of Muharram, the first month in the Islamic calendar. Nowruz also known as Persian New Year marks the first day of spring and the beginning of the year in the Iranian calendar. It is celebrated on the day of the astronomical vernal equinox, which usually occurs on March 21 or the previous/following day depending on where it is observed. Nowruz has been celebrated for over 3,000 years by the related cultural continent. The holiday is also celebrated and observed by many parts of Central Asia, South Asia, Northwestern China, Crimea and some groups in the Balkans. As well as being a Zoroastrian holiday and having significance amongst the Zoroastrian ancestors of modern Iranians, the same time is celebrated in the Indian sub-continent as the new year. The moment the Sun crosses the celestial equator and equalizes night and day is calculated exactly every year and Iranian families gather together to observe the rituals. 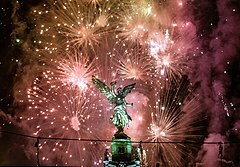 This day is traditionally a religious feast, but since the 1900s has also become an occasion to celebrate the night of December 31, called New Year's Eve. 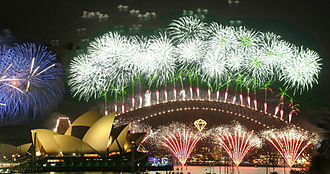 There are fireworks at midnight at the moment the new year arrives (a major one is in Sydney, Australia). Watchnight services are also still observed by many. On New Year's Day, people in certain countries gather on beaches and run into the water to celebrate the new year. In Canada, the Republic of Ireland, the United Kingdom, the United States, and the Netherlands this is very popular. These events are sometimes known as polar bear plunges, and are sometimes organized by groups to raise money for charity. Polar Bear Clubs in many Northern Hemisphere cities near bodies of water, have a tradition of holding organized plunges on New Year's Day. In Scotland, there are many unique customs associated with the New Year. These form the Scottish celebration Hogmanay—the Scots name for New Year's Eve. The street party in Princes Street in Edinburgh is one famous example. In Greece and Cyprus, families and relatives switch off the lights at midnight, then celebrate by cutting the vasilopita (Basil's pie) which usually contains one coin or equivalent. Whoever wins expects luck for the whole year. After the pie, a traditional game of cards called triantaena (31) follows. In the Philippines, New Year's is considered part of the Christmas holiday. Noise is made on New Year's Eve with firecrackers and horns (amongst other methods) to dispel evil spirits and to prevent them from bringing bad luck to the coming new year. Tables are laden with food for the Media Noche (midnight meal), and a basket of twelve, different round fruits is displayed to symbolise prosperity in each of the coming twelve months. Public New Year's parties are organised by city governments, and are very well-attended. In Russia and the other 14 former republics of the Soviet Union, the celebration of Novi God is greeted by fireworks and drinking champagne. Because religion was suppressed in the Soviet Union the New Year holiday took on many attributes associated with Christmas in other countries, including Christmas trees, Ded Moroz (a variant of Santa Claus) and family celebrations with lavish food and gifts. In Moscow, the president of Russia counts down the final seconds of the "old year". The Kremlin's landmark Spassky Clock Tower chimes in the new year and then the anthem starts. It is customary to make a wish while the Clock chimes. The Old New Year is celebrated on January 13 (equivalent to January 1 in the "old style" Julian calendar). Although not an official holiday, it marks the end of the holiday season and is usually when people take down trees and other decorations. The Annual Stoats Loony Dook held in Edinburgh, Scotland on the 1st January. in the Southern United States traditional New Year's Day menu includes ham, blackeyed peas or Hoppin' John, cabbage, sweet potatoes, and cornbread. Music associated with New Year's Day comes in both classical and popular genres, and there is also Christmas song focus on the arrival of a new year during the Christmas and holiday season. Johann Sebastian Bach, in the Orgelbüchlein, composed three chorale preludes for the new year: Helft mir Gotts Güte preisen ["Help me to praise God's goodness"] (BWV 613); Das alte Jahr vergangen ist ["The old year has passed"] (BWV 614); and In dir ist freude ["In you is joy"] (BWV 615). The annual Vienna New Year's Concert, primarily featuring music composed by the Strauss family, is broadcast around the world. A common image used, often as an editorial cartoon, is that of an incarnation of Father Time (or the "Old Year") wearing a sash across his chest with the previous year printed on it passing on his duties to the Baby New Year (or the "New Year"), an infant wearing a sash with the new year printed on it. Babies born on New Year's Day are commonly called New Year babies. Hospitals, such as the Dyersburg Regional Medical Center in the US, give out prizes to the first baby born in that hospital in the new year. These prizes are often donated by local businesses. Prizes may include various baby-related items such as baby formula, baby blankets, diapers, and gift certificates to stores which specialize in baby-related merchandise. The Anglican Church and the Lutheran Church celebrate the Feast of the Circumcision of Christ on January 1, based on the belief that if Jesus was born on December 25, then according to Hebrew tradition, his circumcision would have taken place on the eighth day of his life (January 1). The Roman Catholic Church celebrates on this day the Solemnity of Mary, Mother of God, which is also a Holy Day of Obligation. In the United States, New Year's Day is a postal holiday. ^ a b Mehra, Komal (2006). Festivals Of The World. Sterling Publishers. p. 69. ISBN 9781845575748. In many European countries like Italy, Portugal and Netherlands, families start the new year by attending church services and then calling on friends and relatives. Italian children receive gifts or money on New Year's Day. People in the United States go to church, give parties and enjoy other forms of entertainment. ^ McKim, Donald K. (1996). Dictionary of Theological Terms. Westminster John Knox Press. p. 51. ISBN 978-0664255114. ^ Hobart, John Henry (1840). A Companion for the festivals and fasts of the Protestant Episcopal Church. Stanford & Co. p. 284. ^ Brunner, Borgna. "A History of the New Year". Infoplease.com. Retrieved January 31, 2014. ^ Andrews, Evan (December 31, 2012). "5 Ancient New Year's Celebrations". History News. Retrieved January 31, 2014. ^ Forsythe, Gary (2012). Time in Roman Religion: One Thousand Years of Religious History. Routledge. p. 14. ISBN 978-0-415-52217-5. ^ Michels, A.K. The Calendar of the Roman Republic (Princeton, 1967), p. 97-8. ^ Kaster (2011), p. 163. ^ Forbes, Bruce David (October 1, 2008). Christmas: A Candid History. University of California Press. p. 114. ISBN 9780520258020. Some people referred to New Year's gifts as "Christmas presents" because New Year's Day fell within the twelve days of Christmas, but in spite of the name they still were gifts given on January 1. ^ Collins, Ace (May 4, 2010). Stories Behind the Great Traditions of Christmas. Harper Collins. p. 88. ISBN 9780310873884. Most people today trace the practice of giving gifts on Christmas Day to the three gifts that the Magi gave to Jesus. ^ Berking, Helmuth (March 30, 1999). Sociology of Giving. SAGE Publications. p. 14. ISBN 9780857026132. The winter solstice was a time of festivity in every traditional culture, and the Christian Christmas probably took its place within this mythical context of the solar cult. Its core dogma of the Incarnation, however, solidly established the giving and receiving of gifts as the structural principle of that recurrent yet unique event. 'Children were given presents as the Jesus child received gifts from the magi or kings who came from afar to adore him. But in reality it was they, together with all their fellow men, who received the gift of God through man's renewed participation in the divine life' (ibid. : 61). ^ Sim, Alison (November 8, 2011). Pleasures and Pastimes in Tudor England. The History Press. p. 85. ISBN 9780752475783. Most of the twelve days of Christmas were saint's days, but the main three days for celebration were Christmas Day, New Year's Day and Epiphany, or Twelfth Night. ^ Harris, Max (March 17, 2011). Sacred Folly: A New History of the Feast of Fools. Cornell University Press. p. 35. ISBN 9780801449567. Retrieved December 31, 2012. ^ Trawicky, Bernard (July 1, 2000). Anniversaries and Holidays (5th ed.). American Library Association. p. 222. ISBN 9780838906958. Retrieved December 31, 2012. ^ Gregg, Cherri (May 13, 2013). "Oshunbumi Fernandez, Caring Through Culture and Odunde 365". CBS Philadelphia. Retrieved December 31, 2013. ^ Helmer Aslaksen, "The Mathematics of the Chinese Calendar"
^ Encyclopedia of Korean Seasonal Customs. The National Folk Museum of Korea (South Korea). 2014. pp. 30–46. ISBN 978-8992128926. ^ a b c "What is 'Serbian New Year'?". Balkan Insight. January 13, 2014. Retrieved January 13, 2017. ^ Mintz, Josh (January 2, 2012). "The Hypocrisy of Turning New Year's Eve in Israel Into a Nonevent". Haaretz. Retrieved January 1, 2016. ^ "Watch Night services provide spiritual way to bring in New Year". The United Methodist Church. Archived from the original on March 1, 2012. Retrieved December 28, 2011. The service is loosely constructed with singing, spontaneous prayers and testimonials, and readings, including the Covenant Renewal service from The United Methodist Book of Worship (pp. 288–294). ^ Kochilas, Diane. The Glorious Foods of Greece. HarperCollins. p. 828. ISBN 9780061859588. Retrieved December 31, 2012. ^ World Book (September 1, 1998). Christmas in the Philippines. World Book, Inc. p. 61. ISBN 9780716608530. Retrieved December 31, 2012. ^ Yue Feng, ed. (1991). 世界节 [World Festival] (in Chinese). ISBN 978-7211058990. ^ Medina, F. Xavier (2005). Food Culture In Spain. Greenwood Publishing Group. p. 46. ISBN 9780313328190. Retrieved December 31, 2012. ^ "History of America's State Parks First Day Hikes". California Department of Parks and Recreation. Retrieved January 4, 2018. ^ "Lucky Foods for the New Year - New Year's Day - Epicurious.com". ^ "Table of Contents: Orgelbüchlein". libweb.grinnell.edu. ^ "The Year Is Gone, Beyond Recall". www.hymntime.com. ^ "Scotland - In the words of the Bard -". Scotland. ^ Birx, H. James (January 13, 2009). Encyclopedia of Time: Science, Philosophy, Theology, & Culture. Sage Publications. p. 510. ISBN 9781412941648. Retrieved December 31, 2012. ^ "DRMC rounds up prizes for New Year's baby, Life Choices". Dyersburg State Gazette. Stategazette.com. December 31, 2008. Retrieved January 1, 2012. "New Year's Day" . New International Encyclopedia. 1905.